Perhaps the most interesting comics series in the wartime French comics weekly Gavroche were 'Le clan des hommes oiseaux [The Clan of Bird-Men]' and its follow-up 'Les Hommes oiseaux au moyen-âge [The Bird-Men in the Middle Ages]', featuring the anti-hero Demonax, one of the earliest, perhaps the earliest anti-hero in the comics medium. The Clan of the Bird-Men, which debutted in no. 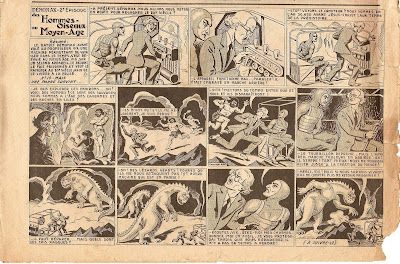 13 (dated Jan 23rd, 1941), were a gang of masked and costumed villains with mechanical wings, led by Demonax. The second episode, which kicked off in no. 29, involves a time machine which takes the characters first to the Middle Ages, and then to the pre-historic ages, as can be seen in the above scan of the installement from no. 42 (dated August 14th, 1941). The saga ended in the next issue, which is unfortunately not available in my collection. The series is signed by Lortac, the pen-name of the multi-talented Robert Collard (1884-1973). While his parents had intended a military career for him, Robert Collard was expelled from the French Military Academy at the age of 16 for lack of discipline. Instead, he attented painting workshops at Paris Fine Arts School and began working as an illustrator & caricaturist at newspapers in 1906. He was drafted for the 1st World War, but was discharged when he was wounded. Eventually, Collard took up an interest in animation and became one of the pioneers of this then-novel craft in France. He also penned several sci-fi and crime novels. Demonax was Collard's first comics work. In the following years, he gave up comics art work, but became a prolific script-writer for comics. 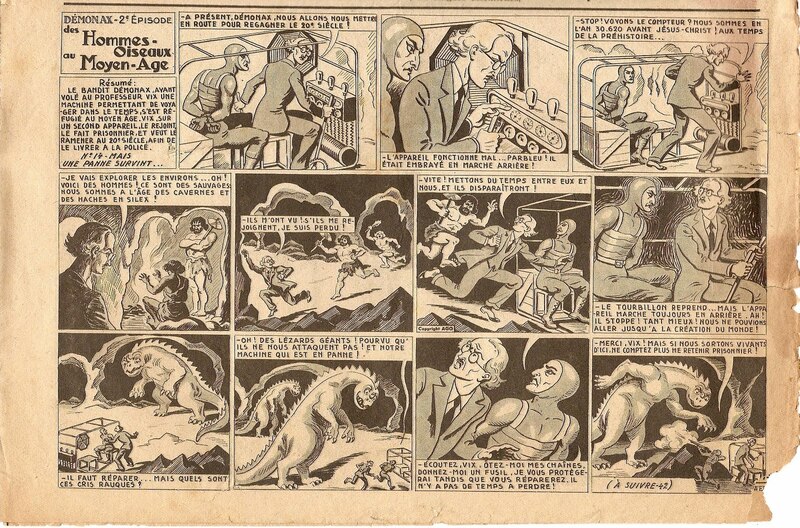 His ouvre in this category include the long-running outer space adventure comics 'Les conquerants de l'espace' serialized in Meteor between 1953-64, as well as several episodes, mostly of fantasy variety, of 'Bibi Fricotin' between 1948-69.